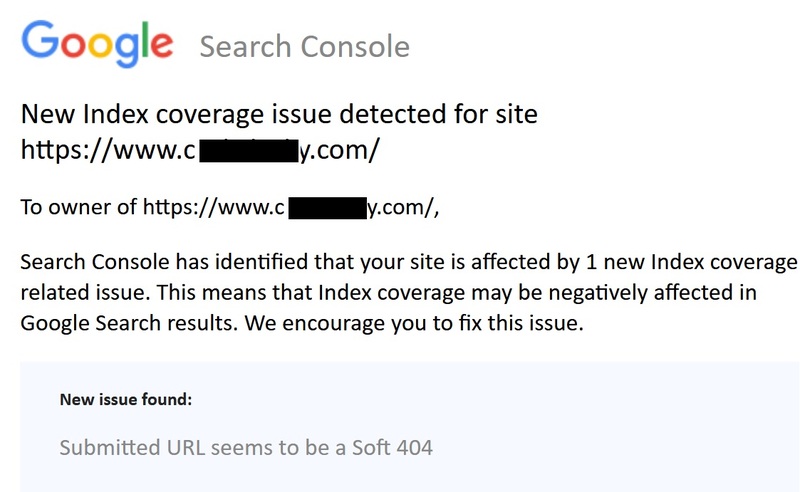 Does Google issue Soft 404 errors for Thin Content? Home → Google My Business → Does Google issue Soft 404 errors for Thin Content? Recently a client came to me with a site ranking poorly in Google’s search results after some quality algorithm updates. Within a minute of looking the site over the problem was clear: they had thin content. In this case, the website consisted of some pages about the brand and some pages where their product could be purchased. The product pages in particular had the thin content. The product pages basically consisted of an image, a sentence, and a “buy now” button. I informed them of their issue right away and they have been drafting up content. Ironically, just days after my assessment they began receiving errors from Google. Yes, Google issues Soft 404 errors for Thin Content problems when a page contains little or no usable content. On June 26, 2018, an error came in via Google Search Console. The message says “New issue found: Submitted URL seems to be a Soft 404”. The URL was not new and was not submitted (recently). The URL was discovered via Google via a crawl or via the sitemap back in 2017. In this case the page probably appears to be an automatically generated page to Google since it has such little content on it. The page with the Soft 404 was de-indexed from Google’s search results. What is a Soft 404? A soft 404 means that a URL on your site returns a page telling the user that the page does not exist and also a 200-level (success) code to the browser. (In some cases, instead of a “not found” page, it might be a page with little or no usable content–for example, a sparsely populated or empty page.). In other words, there are multiple things which can return a Soft 404, but if you’re reading this you likely have content issues. In this case the answer is simple. Create better content. I suspect many website owners and businesses are receiving errors like this who have automatically generated pages due to the way their CMS or eCommerce site works, or due to have several similar pages or simply pages without enough content. If you have a content problem and need assistance identifying it or fixing it please feel free to email me. I work with content problems and create content for brands all over the world.